Enjoy the fun of Unlimited Salsa,Bachata & Kizomba classes this July/August, with our mind-blowing Summer Offer*! Purchase an unlimited class package for July or August for AED 595 and attend as many Salsa,Bachata & Kizomba classes as you like. Or save even more by paying 995AED for 2 months, all inclusive. *Offer includes salsa/kizomba courses, as well as salsa/kizomba/bachata drop-in classes. Award-winning children and teen’s acting and musical theatre classes – Hayley’s Comet – will be running weekly summer camps throughout the holidays. Hayley’s Comet is now taking registration for summer camps. Kids aged 6-14 years can join professionally led workshops, acting lessons and dance classes full of fun, high energy and creativity. The perfect activity during the hot months! Each week is a brand new theme that results in a unique show to perform for family and friends. So your young star can join in for one week or multiple weeks. The show is created with professional instructors who will teach dance, drama and music, combined with creative games to build a show from scratch! 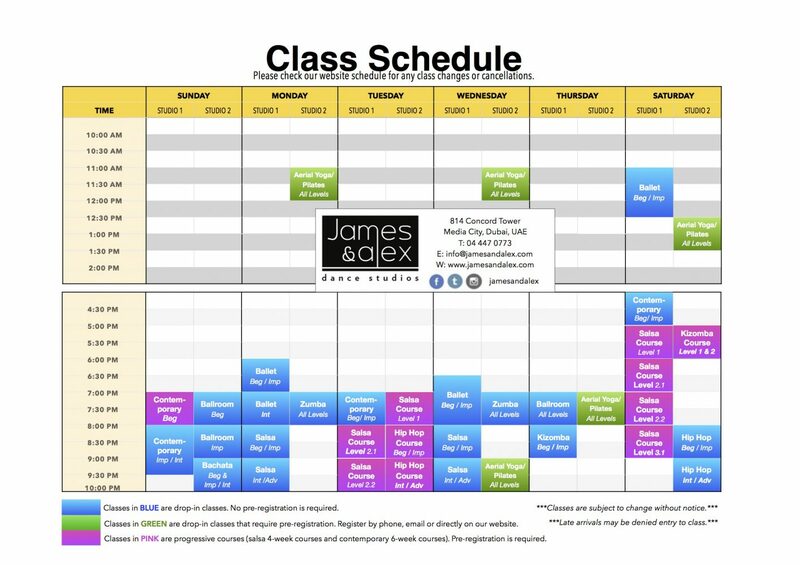 Camps run at James & Alex Dance Studios, Media City 9am-3pm daily. Each camp starts on a Sunday and ends with the performance on Thursday afternoon. The cost of the camp is AED 900 (10% sibling discount). HOWEVER, a special EARLY BIRD promotion means that if you book before 22nd June the camp will cost just AED 800! Children just need to bring a healthy packed lunch… and themselves! The first camp begins Sunday 25th June and they run weekly until the end of August. Please email info@hayleyscomet.com or call 04 4470773 to register and to get further details alternatively visit James and Alex Dance Studios in Media City. Spaces are limited! Hayley Doyle is the founder of Hayley’s Comet. From the UK, she trained at Paul McCartney’s Fame School gaining a BA (hons) in Acting, and made her West End debut playing Ali in ‘Mamma Mia!’. She also has a Masters Degree in Creative Writing and starred in the Madinat Theatre’s ‘Love Loss & What I Wore’. Musical Theatre Summer Camps 25th June – 31st August 2017.
http://jamesandalex.com/wp-content/uploads/2017/05/Hayley3.jpg 683 1024 James & Alex Dance Studios http://jamesandalex.com/wp-content/uploads/2014/11/James-Alex-approved-Logo.png James & Alex Dance Studios2017-06-20 10:07:482017-06-20 10:07:57Musical Theatre Summer Camps 25th June - 31st August 2017. NEW KIDS’ TERM – September to December 2017. Introduce your little ones to the amazing world of dance this September, as we start our new Kids Term from September 9th. See them get mesmerized by the movement and the music, as they follow the path to becoming the next dancing star. 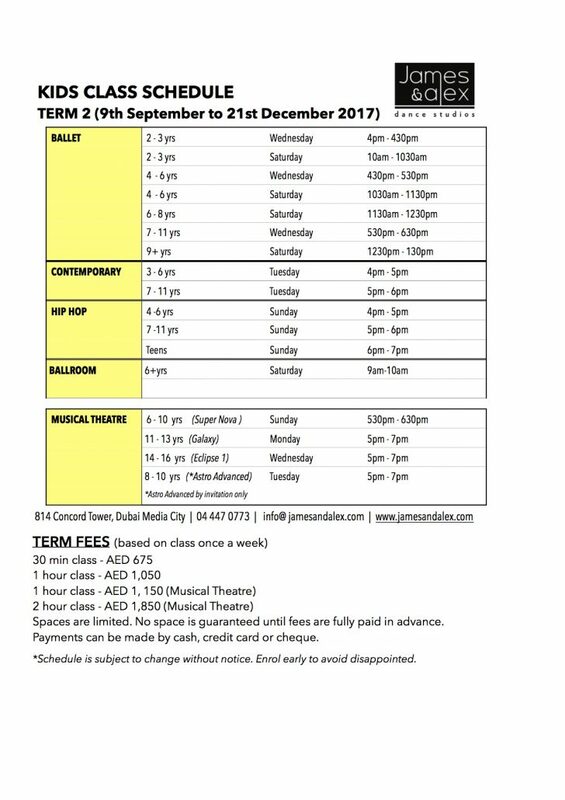 We offer courses in Ballet, Contemporary, Hip Hop,Ballroom and Musical Theatre from the age of two until their early teenage years. At the end of the term, all students will perform in our End of Year showcase, to proudly present what they have learnt over the past 3months. To reserve your place email us at info@jamesandalex.com or call us on 04-4470773. All registered kids will also receive a 10% discount on all clothing bought in the studio shop. http://jamesandalex.com/wp-content/uploads/2017/06/September-Term2017-Featured-Image.jpg 485 695 James & Alex Dance Studios http://jamesandalex.com/wp-content/uploads/2014/11/James-Alex-approved-Logo.png James & Alex Dance Studios2017-06-11 20:07:272017-09-19 19:32:48NEW KIDS' TERM - September to December 2017.